I pray that flowers of auspicious fortune are showered upon you. 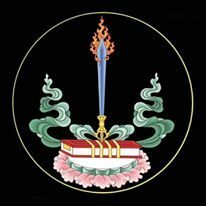 And thus, so it was that in accordance with the stated intent of one of learning and accomplishment, Khenchen Lama, with respect, this was offered up by one with the form of a Trulku (sprul gzugs), the Mantrayāna priest Chöying Rikpay Dorjé (chos dbyings rig pa’i rdo rje). [Composed] on 12/12/2017 (December 12th, 2017).